A few weeks ago we acquired a first edition, first printing of one of the best-selling books among Churches of Christ in the twentieth century. 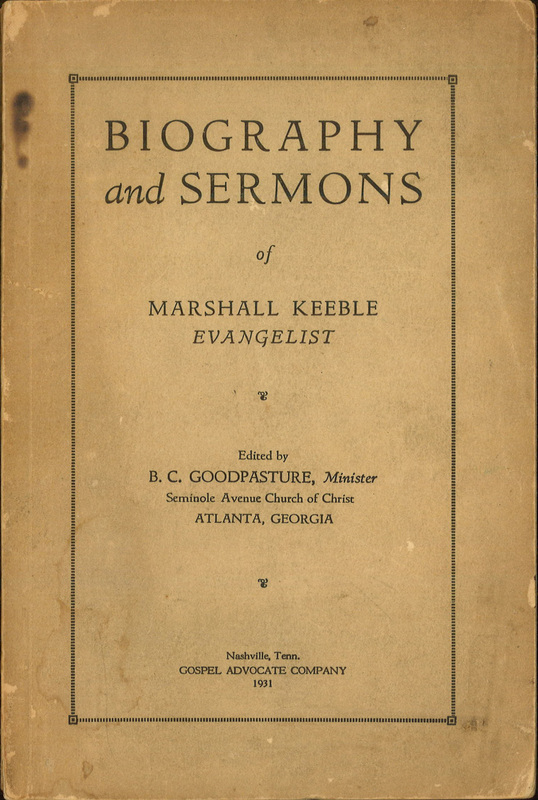 Biography and Sermons of Marshall Keeble, Evangelist debuted in the fall of 1931 and sold out of its first printing within weeks. The new-to-us copy is in much better condition than our existing copy. We will keep both, reserving the worn copy for use by researchers and preserving the better one. I had been looking for a nice copy of a first edition for some time now and I’m grateful that now we have one. Ideally we will have a copy of each of the several dozen printings…I am always looking to improve the scope and quality of the collection. We detailed briefly the remarkable publishing history of this book in an on-site exhibit on the main level of the ACU Library. Though the exhibit has now come down from public display, you can still see it here. This entry was posted in This Just In by Mac Ice. Bookmark the permalink. So glad I was able to secure this copy for you. Amazing that it was near pristine. Had never even been cracked open! Always on the lookout for treasures!